I was cutting it close by working on it until nearly the day of the convention it was supposed to premiere at! But you can see the bottom string-attach knob has been put on, the edges of the front panel have been done. 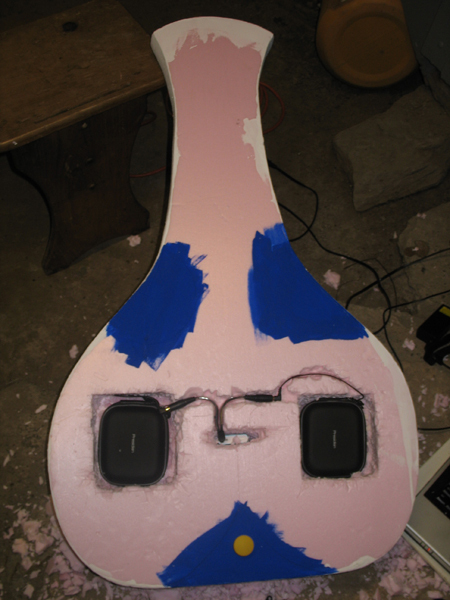 Here's an interior view including the speakers, iPod, and terrible (hidden) paint job. 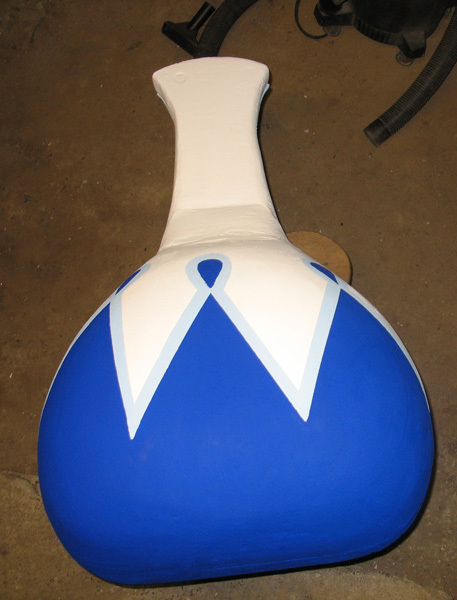 The top half of the front being glued to the foam. 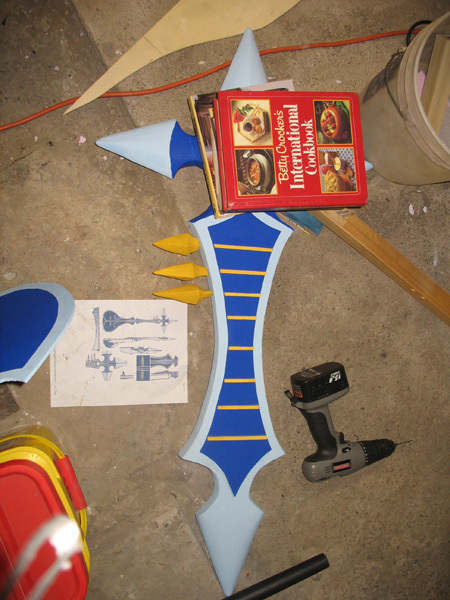 Neck, with everything glued in. Tuning pegs ACTUALLY turn. Unfortunately, also can be pulled out. But won't fall out. 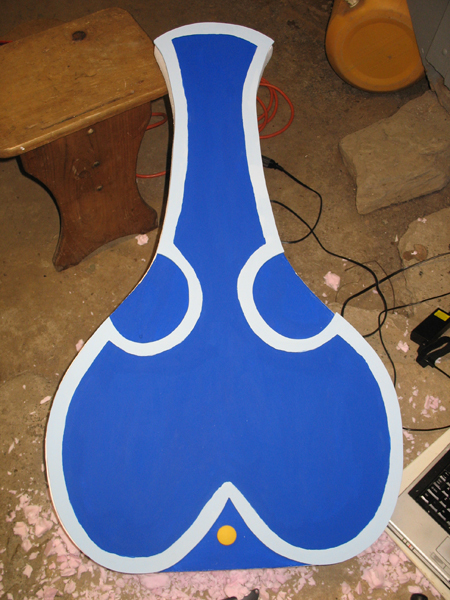 The paint job on the backside (beautifully sanded, if I do say) of the sitar. I am very proud of it. I'm not happy with it, but the curved sitar bridge. 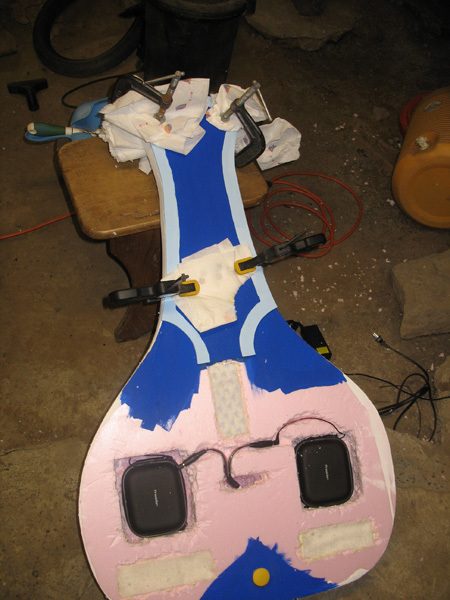 The final shot of the sitar before it went into active costume phase. I am still so proud of this prop. The sitar in its final glory, with me in costume. I was lifting it strangely in this shot to get the whole thing into frame. I finally chose fishing thread as my choice of strings so they would be somewhat invisible, and I love how the flash reacted with them. 1) Resin and fiber glass. They are small to list, but would have vastly improved this prop. Future models have been far superior, but this is still the one sitting in my living room, proudly displayed.